A couple of years ago I came home from a hockey game completely hammered, fired up the ol’ eBay and bid on a dozen outdated globes. I didn’t even remember that I’d done this until days later when my email dinged with a notice that I’d been outbid on one of them. Over the span of a week there were ten more notices as I was thankfully outbid again and again. What would I have done with a dozen globes? Where would I have put them all? Would I have had to move into a middle-school library? In the end I won just one of them, a 12″ Replogle beaut, and when it arrived there was no year marked alongside the copyright information that floats in the middle of an ocean (although the previous owner had helpfully drawn in an X to mark the point furthest from land). 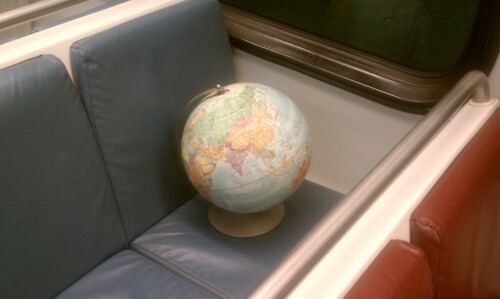 But I was still able to discern when the globe had been made. How? By checking the toponyms, of course! The best way to date an old globe (besides checking the National Geographic personals, har har har) is to examine the cartography for conspicuously dated place names. Every year of modern history has brought with it a reason to redraw the map of the world. Disputes over boundaries take place; territories switch hands; empires fall — and names change. 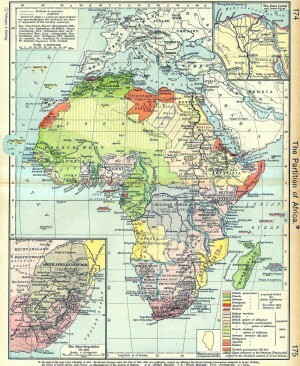 Here are the stories behind a few of the curiosities you may find on your old maps. As a colony, the area had been known as French Dahomey. When the French Fourth Republic collapsed and the Fifth Republic was established by Charles DeGaulle in 1958, the colony gained self-governance. In 1960, the colony achieved formal independence and became the Republic of Dahomey. Fifteen years later the country threw off its final remaining colonial tie, its name, and became Benin. Adopted from the Bight of Benin, the bay that the country lies next to, the name also pays homage to the pre-colonial Benin Empire. Captain James Cook christened the Y-shaped archipelago the “New Hebrides” in the 1770s while sailing through the area. Apparently, something about the lush tropical paradise reminded him of… western Scotland? The islands remained largely undisturbed by Westerners until 1906, when the chain was divided between Britain and France, resulting in an Anglo-French condominium. With three governments simultaneously in power; one English, one French, one local; we can only assume some zany bureaucratic hijinx ensued (a mailroom boy appointed ambassador to Japan, a foghorn blast decreed as the national anthem, etc.). After decades of colonial tensions, Britain and France peacefully agreed to grant independence to the New Hebrides. The ruling political party at the time conceived the name from ‘vanua,’ which means ‘land’ in one of the area’s 500 languages; a syllable was added to make it ‘our land,’ Vanuatu. Awww. The “new” name actually isn’t new at all — the city was called Nizhny Novgorod when Maxim Gorky, a progenitor of Socialist Realism, was born there in 1868. Joseph Stalin renamed the city in the activist’s honor in 1932 and then closed it off to all foreigners, his reason being that the city was the center of Soviet military research and advancement. No street maps of Gorky were allowed. The city was reopened to outsiders on October 22, 1990, and officially renamed Nizhny Novgorod as a symbol of glasnost. A classic case of the-grass-is-greener, the area to the, ahem, east of Gary, Ind., named itself East Gary in order to create ties with the bustling metropolis and draw wealthy executives from its steel plants. Sixty-nine years later, the fickle city of 12,000 reverted back to its former name, the more affluent-sounding Lake Station, to distance itself from now grimy and distasteful Gary. Go ahead, roll your eyes, I’ll wait here. Tanganyika and Zanzibar individually gained independence from the UK in the early 1960s. Fewer than five years later, in a move that was controversial on both sides but ultimately achieved without violence, the two joined together to form the United Republic of Tanzania (though all-islands Zanzibar remains semi-autonomous, and has recently started testing the waters for a completely independent state). Syria, fearing a Communist takeover from within, merged with Egypt after the Egyptian president declared that joining Egypt was the only way to avoid the “threat” facing the country. The two non-contiguous lands held an unsteady bond as one nation for only a couple of years before pressure from Jordan, Iraq, and the rest of the Arab League became too much for Syria; it split off and, having successfully avoided the Communist threat, became autonomous once again. Top image courtesy of British Empire.co.uk.